This will be taking place in the Tangled Wood, and will follow our dragons as they search for answers to mysterious pasts. Will they find these answers? Only time will tell. I will be using medium mode for battles, randomly choosing dragons to fight in the coliseum. I’ll post as often as I can, though I may miss a day or two sometimes. I will have some changes from the regular Pinkerlocke, however. I'll try and write a little every single day, not just when I get materials. Also, instead of drawing when I get trinkets, I’ll do small character sketches of dragons. For instance, I could be talking about little quirks they might have, or describing their personalities. If I run out of dragons, I may just do another writing day instead. [size=6][u][b]The cast so far:[/b][/u][/size] [url=http://flightrising.com/main.php?dragon=40118771] [img]http://flightrising.com/rendern/avatars/401188/40118771.png[/img] [/url] Duskrunner. Starter dragon. [url=http://flightrising.com/main.php?dragon=40145012] [img]http://flightrising.com/rendern/avatars/401451/40145012.png[/img] [/url] Aiki. Starter dragon. [url=http://flightrising.com/main.php?dragon=40126837] [img]http://flightrising.com/rendern/avatars/401269/40126837.png[/img] [/url] Katsura. Starter dragon. [url=http://flightrising.com/main.php?dragon=40568027] [img]http://flightrising.com/rendern/avatars/405681/40568027.png[/img] [/url] Autumn. Found from an egg. [url=http://flightrising.com/main.php?dragon=40872926] [img]http://flightrising.com/rendern/avatars/408730/40872926.png[/img] [/url] Vaz. Ran away from home. [url=http://flightrising.com/main.php?dragon=41153483] [img]http://flightrising.com/rendern/avatars/411535/41153483.png[/img] [/url] Soren. Dusk and Kat’s second hatchling. [url=http://flightrising.com/main.php?dragon=41153485] [img]http://flightrising.com/rendern/avatars/411535/41153485.png[/img] [/url]Raven. Dusk and Kat’s fourth hatchling. [url=http://flightrising.com/main.php?dragon=42576491] [img]http://flightrising.com/rendern/avatars/425765/42576491.png[/img] [/url]Niles. Ran into Soren and decided to help. [url=http://flightrising.com/main.php?dragon=42694927] [img]http://flightrising.com/rendern/avatars/426950/42694927.png[/img] [/url] Aspen. A rough-around-the-edges loner, who's hanging out with Soren and Niles. Autumn. Found from an egg. Vaz. Ran away from home. Soren. Dusk and Kat’s second hatchling. Raven. Dusk and Kat’s fourth hatchling. Niles. Ran into Soren and decided to help. Aspen. A rough-around-the-edges loner, who's hanging out with Soren and Niles. To avoid spoilers, I’m not including images, just links to the dragons. Anything helps: potions, battlestones, apparel, familiars, or funds! 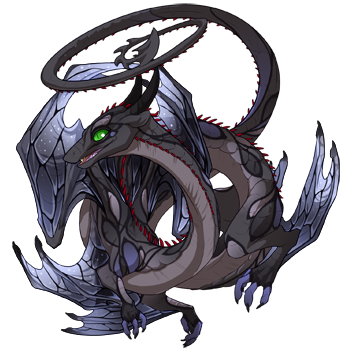 AAAAND START I used the random number generator to pick my dragons, so here they are: First: I got 12, which is coatl! [url=http://flightrising.com/main.php?dragon=40118771] [img]http://flightrising.com/rendern/350/401188/40118771_350.png[/img] [/url] Meet Duskrunner, an adorable hatchling with a tragic backstory. Second: 4, which is pearlcatcher! [url=http://flightrising.com/main.php?dragon=40145012] [img]http://flightrising.com/rendern/350/401451/40145012_350.png[/img] [/url] This is Aiki. Third: 7, a spiral! [url=http://flightrising.com/main.php?dragon=40126837] [img]http://flightrising.com/rendern/350/401269/40126837_350.png[/img] [/url] She is named Katsura. I'm going to write a little backstory, as the dragons aren't grown up yet. I'll start with Duskrunner! [center][u]The Beginning:[/u] The coatl shivered, and curled up more tightly in the brambles. All he knew, was he had found a safe spot. He had to stay away from the light, the dancing, flickering light, which had driven him from his family... He remained silent in the darkness, letting it cover him. Closing his eyes, he tried to forget that he was alone, that no one was there to help anymore. First: I got 12, which is coatl! Meet Duskrunner, an adorable hatchling with a tragic backstory. Second: 4, which is pearlcatcher! I'm going to write a little backstory, as the dragons aren't grown up yet. I'll start with Duskrunner! The coatl shivered, and curled up more tightly in the brambles. All he knew, was he had found a safe spot. He had to stay away from the light, the dancing, flickering light, which had driven him from his family... He remained silent in the darkness, letting it cover him. Closing his eyes, he tried to forget that he was alone, that no one was there to help anymore. Believe it or not, before I got this my forum signature was nice looking.